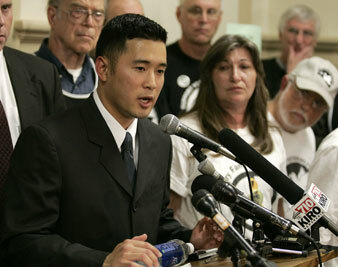 AP Images Watada, center, speaks to reporters and supporters, Wednesday, June 7, 2006, in Tacoma, Wash.
Editor's Note: This article has been corrected regarding the military record of Mike Wong and Gerry Condon. They are not Vietnam War veterans, but Vietnam war resistors. As Americans are inundated with revelations about the lies, torture and other crimes that accompanied the US-led war in Iraq, many who resisted continue to be punished for refusing to participate in those crimes. First Lt. Ehren Watada, the first commissioned military officer to refuse deployment to Iraq, won a significant legal victory last week when the US Department of Justice dropped efforts to retry him after a bungled court-martial. But his legal problems continue. As America struggles with how to hold its homegrown war criminals accountable, those who resisted provide lessons for how to prevent war crimes in the future. Releasing Watada from the Army, and providing amnesty for all those who have been punished for resisting the Iraq War, must be a central part of America’s coming to terms with Bush administration policies. Indeed, their arguments and actions should be studied by every civics class and everyone who aspires to high public office. In 2006, Watada, an infantry officer based at Fort Lewis, Washington, refused to be deployed to Iraq on grounds that the war was illegal and immoral and that to participate in it would make him complicit in war crimes. The Army court-martialed him, but at the last minute Military Judge John Head declared a mistrial. The Army attempted to retry him, but civilian US District Court Judge Benjamin Settle barred the retrial as a violation of the Constitution’s ban on double jeopardy. The Army then appealed the decision, but last week Solicitor General Elena Kagan ordered the appeal withdrawn. Yet the Army is still considering further action against Watada. Now that most Americans, including President Obama, understand the truth of Lt. Watada’s assertion that the Iraq War was based on a lie, it is time to let Ehren Watada go. These are the real issues about the Iraq War that Americans must grapple with in the future. The Army’s behavior toward Watada has been disgraceful from the start. The entire controversy could have been forestalled if the Army had not refused his initial request to resign. The Army charged Watada not only with “missing movement” but with “conduct unbecoming an officer and a gentleman” for speaking critically of government policy and President George W. Bush in ways that the military’s own courts had repeatedly established to be constitutionally protected. In an effort to intimidate Watada’s supporters, Army prosecutors subpoenaed journalists and organizers of public meetings. Judge Head conducted the court-martial without regard for basic principles of justice and fairness. He ruled Watada’s motivation irrelevant and prohibited any testimony on whether the orders he was given were, in fact, legal. He declared a mistrial over the objections of the defense; the civilian judge who reviewed the case charged that “the military judge likely abused his discretion” in doing so. Army prosecutors then initiated a second court-martial of Watada on the same charges, which a civilian judge declared to be a violation of the Constitution’s protection against double jeopardy. The Army then announced that it would appeal the case, but took no action for eighteen months, all the while refusing to allow Watada’s long overdue discharge from the Army. In late April, Mike Wong and Gerry Condon, Vietnam war resisters and members of Veterans for Peace, learned that the Army had referred the decision regarding its appeal of the federal court’s double jeopardy ruling to the US solicitor general. They initiated an Internet-based “Ad Hoc Campaign to Free Ehren Watada.” Their alert was reposted on over 300 blogs and websites, resulting in hundreds of phone calls, letters and e-mails to the Obama Justice Department officials. Nine days later, the Justice Department withdrew the appeal. According to Kenneth Kagan, one of Watada’s attorneys (and no relation to Elena Kagan), the Army could have drawn out its appeal until 2010 or 2011. But the new solicitor general sought to take a “leadership position” on the case. “It’s obviously a bold decision to depart from past policies,” he said. Yet even after the Justice Department ordered the appeal withdrawn, the Army is still maintaining its option to punish Watada on two additional counts of “conduct unbecoming an officer” that were withdrawn during the original court-martial. When these charges were initially brought, they caused a firestorm that reached far beyond the peace movement. Civil liberties groups pointed out that Watada had followed all the Army’s rules in making public statements–wearing civilian clothes, not his uniform; notifying his base commander; and making clear he was not speaking for the Army. Media organizations launched a campaign against the Army’s subpoenaing of journalists, which was followed within a few days by the Army’s withdrawal of the charges. Watada support organizer Mike Wong told The Nation that resolving the 31-year-old officer’s legal situation would be a healing act. If and when that happens, Ehren Watada plans to attend law school. Ehren Watada’s stand raises unsettling questions for government officials and ordinary Americans alike that go beyond punishing the bad guys. What is our duty in the face of evidence that our government is committing crimes? It may be ludicrous for House Speaker Nancy Pelosi to claim she didn’t know about US torture (if the CIA didn’t tell her she could have read about it in the Washington Post), but it is equally ludicrous for any American who can read a newspaper to claim that he or she was unaware of the Bush administration’s lies about weapons of mass destruction, its legal denial of the Geneva Conventions, the mass killings of civilians in Fallujah and elsewhere, use of white phosphorous against civilians, prisoner abuse in Abu Ghraib and other US war crimes in Iraq. Yet many people did in fact take a stand, often at personal risk, to oppose those crimes. Some, like Watada, took a public stand. Some went underground or escaped the country. As the secret history of the Iraq War is revealed memo by memo, we also learn more about the internal whistle-blowers, even within the highest circles of the Bush administration and the military, who fought against the torture policy. As Rhode Island Democratic Senator Sheldon Whitehouse put it in last week’s torture hearings, Americans were not told “how furiously government and military lawyers rejected” the legal opinions justifying torture. If we are truly to draw the lessons of Iraq, we need not only to hold criminals accountable; we need to hold up as role models the whistle-blowers and resisters who refused to go along with them. We need national reflection on the responsibilities of individuals and officeholders to prevent war crimes in the future. Future Congressional investigations and truth commissions should hold up those who opposed war crimes for admiration and emulation. Many Iraq War resisters remain prisoners or fugitives. There are more than fifty public resisters in Canada and an estimated 250 more underground. While the Army just kicks most AWOL deserters out with an administrative discharge, it singles out those who have spoken publicly against the war for severe punishment. As recently as this April, the Army sentenced Clifford Cornell, a resister who was forced to leave his refuge in Canada, to twelve months in a military prison and a bad conduct discharge. As America debates what to do with its accused war criminals, isn’t it time to exonerate Ehren Watada and all those who those who stood up against their war crimes?